UPDATE | Lachlan Markay - 6/25, 3:00 PM: A roundup of reactions from all over the blogosphere and twitterverse below the fold. Washington Post blogger Dave Weigel resigned today after a host of offensive e-mails surfaced revealing his disdain for much of the right - the beat he was charged with covering. Fishbowl DC, which published a number of those emails yesterday, confirmed the resignation with the Post just after noon. Yesterday I reported on leaked emails from Weigel to a listserve of liberal journalists bashing conservatives and conservatism - you know, the people Weigel is supposed to be covering. As bad as those email were, a plethora of messages from Weigel published in the Daily Caller take the conservative-bashing to a whole new level. The new emails also demonstrated that yesterday's quasi-apology from Weigel was really not as sincere as he claimed. He said that he made some of his most offensive remarks at the end of a bad day. But these new emails show that there was really nothing unique about them, and that offensive remarks about conservatives really were nothing new or uncommon. Many of the misguided statements were clearly made in jest - "I hope he fails," Weigel said of Rush Limbaugh after the radio host was hospitalized with chest pains, a reference to Limbaugh's hope that Obama's agenda would fail. But other bouts of name calling - ragging on the "outbursts of racism" from "amoral blowhard" Newt Gingrich, for instance - were obviously not jokes. Republicans? “Ratf--king [Obama] on every bill.” Palin? Tried to “ratf--k” a moderate Republican in a contentious primary in New York. Limbaugh? Used “ratf--king tactics” in urging Republican activists to vote for Hillary Clinton in open primaries after Obama had all but beat her for the Democratic nomination. First, there's the issue of whether anything said on a 400-member email list can really be considered "private." "There’s no such thing as off-the-record with 400 people," Nation columnist Eric Alterman told Politico. But the real issues are, first, whether such mean-spirited jabs demonstrate a disdain for many conservatives that precludes Weigel from covering them fairly (he did label gay marriage opponents "bigots," after all), and second, whether the Post feels it is appropriate to have someone hostile to the right covering conservatism, while a through-and-through liberal in Ezra Klein covers the left. The Post signaled that it did not consider Weigel's comments to be a serious problem. It seems that attitude has changed. Managing Editor Raju Narisetti told Politico that "Dave’s apology to readers reflects he understands, in calmer hindsight, the need to exercise good judgment at all times and of not throwing stones, especially when operating from inside an echo-filled glass house that is modern-day digital journalism." He added that it was "time to move on." The Post decliend comment on Weigel's resignation. Below is a roundup of reations from prominent online commentators since Weigel's resignation. Politico's Ben Smith paints Weigel as an unfortunate casualty of the collapsing facade of objectivity in the Post's online efforts. The current flap over Washington Post blogger Dave Weigel has its roots in a fact that suprised me when I learned of it earlier this year: The Post appears to have hired Weigel, a liberal blogger, under the false impression that he's a conservative. The new controversy over the revelation that he's liberal is primarily the Post's fault, not his, except to the degree that he allowed the paper's brass to put him in an unsustainable position. And indeed, one of the most interesting elements of the reaction to Weigel's resignation seems to be the admission, or at least the acknowledgment, that he is, in fact, a liberal. The "libertarian" label seemed to stick. But today, Weigel's liberalism was treated as a given. Even Keith Olbermann, on whose show Weigel is a regular guest, tweeted his agreement: "If the WaPost didn't know @DaveWeigel wasn't a conservative blogger, it's time for the Post to FOLD. My full support is yours, David." At the Atlantic, Jefferey Goldberg made that observation almost in passing. Goldberg went on to make what has been (somewhat surprisingly) a sparsely invoked argument in the hours since Weigel's resignation: that the crudity of his comments itself was enough to sully his reporting. "How could we destroy our standards by hiring a guy stupid enough to write about people that way in a public forum?" one of my friends at the Post asked me when we spoke earlier today. "I'm not suggesting that many people on the paper don't lean left, but there's leaning left, and then there's behaving like an idiot." 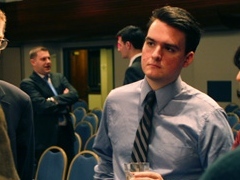 Others, such as NewsBusters contributor Dan Gainor and National Review's Jim Geraghty, attributed Weigel's decline not so much to the language he used as to his style of reporting; his tenancy to seek out the fringe elements of the movement, and focus on them, rather than on mainstream conservatism.